Reducing Homelessness With the Housing First Model — Does It Work? Housing First programs require few or no preconditions, such as participation in mental health or substance use disorder treatment, from the people they serve. Jeanine, 48, a mother of three, lives on the streets. Her homelessness began the night she and her children fled her husband when he broke both of her arms, her leg, and her jaw. The social worker at the hospital found her temporary housing in a shelter for survivors of domestic violence. When she was once again able to walk and use one of her arms, she sought new employment, as she was too afraid to return to her former job, where her husband could find her. However, she was only able to find low-wage, temporary jobs. When her time in the shelter ran out, she was unable to afford safe, stable housing for her children; plagued with chronic pain from her many injuries; and unable to meet the copays for her prescriptions, so she turned to street opioids to get through the day. The public child welfare agency, citing her substance use, erratic employment, and homelessness, placed her children into three different foster homes and told Jeanine to participate in substance use treatment, parenting skills training groups, and psychotherapy for her PTSD, depression, and anxiety. Try as she might, she missed visits with her children and other appointments because her permanently injured leg made it impossible for her to stand for long periods of time, take busses, or walk distances. Ultimately, her parental rights were terminated. One winter night, her feet bloody and sore and her leg in chronic spasm from walking all day, she took shelter in an abandoned building. There, she was raped. Another night, an infected spider bite landed her back in the emergency department, where half of the foot on her one "good" leg was amputated. An avalanche of life events can cascade into homelessness that causes or exacerbates physical, mental health, and substance use issues that make securing long-term housing virtually impossible. Generally, the thin, frail network of supportive services for people experiencing homelessness lacks coordination, and, often, providers who aim to help engage in practices that alienate the people they intend to serve. For example, it is not unusual for a person experiencing homelessness and addiction to be told by a health care provider, "I can't help you with your physical pain until you stop using." The patient responds, "I've tried to stop. I've detoxed five times, and I just keep relapsing." The provider may adhere to the belief that detox is treatment, when in fact data show that detox is a first step; many people need longer-term, ongoing, multidimensional intervention in order to maintain sobriety, and occasional relapse is a predictable part of the maintenance phase in the recovery process. Some shelters and other service providers have policies that any potential consumer who shows up under the influence of alcohol or other substances, or who is currently involved in the facility but uses substances, must be turned away. The programs may provide services only as long as the client complies with a predetermined treatment plan; thus, clients who fail to show up for appointments, do not participate in group meetings, or break house rules must leave. There are many compelling reasons why a person who is experiencing homelessness might not "comply" with providers' expectations. For example, in Jeanine's situation, exhaustion from having no place to sleep, miles and miles of walking each day because of no bus fare, and the absence of bus service in the first place, plus physical and mental health issues, are just a few of the obstacles making it impossible to get to appointments. Yet some providers erroneously see the noncompliance as lack of motivation, resistance, and oppositional behavior. For these and other reasons, it is not unusual for people experiencing homelessness to feel leery, wary, tentative, frightened, or hostile towards service providers. The trauma people have experienced before or during homelessness, and in interactions with providers, has generated at times a contentious, suspicious relationship with the programs designed to serve the population. Hence, establishing trust can be a very slow process. The vast literature on trauma-informed practice is quite clear that establishing safety is necessary for effective client/provider collaboration. Maslow's hierarchy also notes that basic needs must be met first. Aware of how service providers cobbled together a system that unintentionally victimized the people it aimed to help, Sam Tsemberis, PhD, in the 1990s developed a model known as Housing First. Its goal is to quickly provide safe, affordable, permanent housing quickly to people who are experiencing homelessness, particularly, although not solely, those with chronic homelessness and co-occurring conditions such as mental illness or substance use disorders. Housing First programs require few or no preconditions, such as participation in mental health or substance use disorder treatment, from the people they serve. In addition to permanent housing, Housing First programs provide a wide range of wraparound services that are readily available to participants and offered assertively, but not required. Studies show that that when people experiencing homelessness are given safe, stable, affordable housing, they are better able to address other problems and needs in their lives, such as substance use disorders and mental illness. As a result, homelessness, frequent use of hospital emergency departments, and psychiatric hospitalizations are reduced. • Applicants may enter the program without income, with poor credit, and without a financial and/or rental history. • Applicants may enter the program if they are still using alcohol or other substances. • Applicants may enter the program if they have been or are involved in the criminal justice system for felonies or misdemeanors. • Although participation in service plans is offered regularly as a resource, tenants cannot be evicted for not following through with treatment programs. • People with disabilities are invited to request reasonable accommodations, and apartments that provide these are included. • Programs that are unable to serve an applicant participate in a coordinated service entry system so applicants have access to housing and other services elsewhere. • The client, not service providers, drives the goals for housing and other services. • Supportive services focus upon engaging the client in problem solving. • A harm reduction approach is used, offering education on how to avoid risky behaviors but not demanding sobriety. • Flexible rent payment plans and help with managing finances, including representative payee arrangements, are provided. • Whenever possible, eviction is avoided, and tenants are offered the opportunity to transfer to another program. A Housing First approach goes beyond the individual program level to include a community's entire system for responding to homelessness. This system involves multiple elements: The process for entering the system is coordinated, including outreach and crisis intervention on the streets, emergency shelter, short-term rapid rehousing, and longer-term supportive housing. In addition, keen attention is paid to eliminating barriers to accessing services. For example, a collaborative, nonjudgmental approach is used, focusing on slowly building trusting relationships with potential consumers, viewing them as experts in their own lives and as the service providers' teachers. Shared assessment tools and vulnerability indexes are used to prioritize who receives housing assistance; applications and screening are standardized and restrictive criteria eliminated. The community's social, health, and behavioral health services do not require sobriety as a precondition for eligibility. Staff across the housing and social service spectrum is trained in evidence-based engagement strategies such as motivational interviewing and trauma-informed practice. In addition, data are gathered and routinely analyzed to track use of the hospital emergency department, psychiatric hospitalizations, and criminal justice system involvement. Housing First programs can consist of rental apartments in one building or be in scattered site rental apartments where natural social supports and supportive services are accessible. A trauma-informed approach permeates Housing First. Homelessness is traumatizing, as loss of safe, affordable, stable shelter is life threatening. In fact, the average life expectancy for a homeless person in the United States is merely 48 years, less than the life expectancy in many impoverished nations. When a housing program insists that tenants engage in behaviors that tenants feel unable to do, such as maintain sobriety, tenants and prospective tenants may have a fight-flight-freeze response. Some tenants might, for example, yell and curse. Those who freeze become immobilized with anxiety or distress. Others simply go away. Providers may perceive these reactions inaccurately, pejoratively, not as instinctive survival mechanisms, but as irrational yet purposeful self-sabotage. A trauma-informed provider, instead, recognizes the reactions as the result of a highly activated amygdala overwhelming the prefrontal cortex. A Housing First approach seeks to establish safety and trust in order to minimize fight-flight-freeze reactions. A Housing First program puts a participant's basic physical and emotional safety first by taking the stance that the housing is secure and that other behavioral requirements are at the participant's discretion. Service providers grasp the evidence-based view that resistance is not a quality within the participant but rather arises within the interactions the participant has with providers. Thus, participant voice and choice are paramount. A harm reduction approach is used. It makes intuitive sense that if a person with an alcohol use disorder is told, "If you drink, you cannot stay here," that message can exacerbate the anxiety and distress that trigger the person's alcohol use. If a person with PTSD is told, "If you raise your voice one more time, you'll be evicted," the fear of being homeless again can trigger another emotional outburst. Similarly, if a person with major depression is told, "You must keep your apartment cleaner or you'll be evicted," the threat can aggravate feelings of hopelessness, worthlessness, and guilt that deepen depression, leaving the person immobilized. In short, program expectations can overwhelm a tenant's coping capacities. Housing First turns this situation on its head. First, the person is housed, because safe shelter is a basic human need. When the safely housed person is ready to tackle other issues, services are readily available. Those who eschew a Housing First approach may argue that consequences are necessary in order to change behavior and that it's just not right to provide housing without expectations because to do so enables dysfunctional behavior. Hence, a key question for policy and practice is "How do the outcomes of Housing First interventions compare with treatment as usual (TAU) for homelessness?" Brown et al. (2016) found that participants in a Housing First program, when compared with those who received TAU, spent less time homeless, spent less time hospitalized, and had enhanced use of needed services, including substance use treatment and mental health, medical, dental, and vision care. It appears that when providers avoid coercive relationships with participants, use of needed services improves. This finding is in sync with research on motivational interviewing; when providers follow the client's lead, instead of pushing or pulling the client, they help unleash the client's internal motivation, propelling clients towards their own goals. Somers et al. (2017) found that participants in both congregate and scattered-site Housing First programs were better able to achieve stable housing than were participants in TAU and experienced significantly greater perceived quality of life. A Housing First program funded by the U.S. Department of Housing and Urban Development in 2007 and 2008 showed favorable results for people who had been homeless for five years or longer and were also struggling with mental health and substance use challenges (Tsemberis, Kent, & Respress, 2012). Studies indicate that "high fidelity" Housing First programs—those that truly honor the guiding principles and practices of the Housing First model—have better housing retention rates and are associated with fewer emergency department visits and better health, mental health, and social outcomes when compared with more traditional approaches to providing housing to people experiencing homelessness. It can be challenging to draw definitive conclusions from research studies about the effectiveness of Housing First programs, because different programs may have different program elements, serve populations with different complex needs, and use different outcome measures. Randomly assigning consumers to different housing programs presents practical and ethical issues as well. That said, several studies show that Housing First programs have better outcomes than other housing programs. Other studies suggest that TAU and Housing First may have similar outcomes. That leaves us with an ethical decision to make. Should we favor the more humane, client-centered, nonjudgmental approach that views safe, stable, affordable housing as a human right? 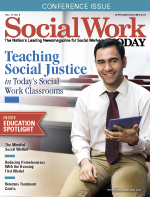 Social work's mission and values, articulated in the NASW Code of Ethics, are to work with and on behalf of the most disadvantaged vulnerable among us, seeking to enhance their self-determination, autonomy, and well-being. It is clear that Housing First is a preferable option that embraces a coordinated system of care at the micro, mezzo, and macro practice levels. Developing the political will and educating potential funding sources, including state, local, and federal governments, will be key to expanding Housing First programs. Addressing the systemic causes of homelessness is crucial, including subsidies to developers to expand the supply of affordable housing, rental subsidies, income support programs, expanding the economy to eradicate income disparities and ensure that full-time workers earn living wages, providing evidence-based substance use and mental health services, and ensuring universal health insurance with parity for substance use and mental health services. Homelessness affects many Americans, including veterans, immigrants, refugees, LGBTQ people, people involved in the criminal justice system, families, and many children. Homelessness and the social costs it spawns can be eliminated. — Deborah H. Siegel, PhD, LICSW, DCSW, ACSW, is a professor at the School of Social Work at Rhode Island College in Providence. Brown, M. M., Jason, L. A., Malone, D. K., Srebnik, D., & Sylla, L. (2016). Housing First as an effective model for community stabilization among vulnerable individuals with chronic and nonchronic homelessness histories. Journal of Community Psychology, 44(3), 384-390. Somers, J. M., Moniruzzaman, A., Patterson, M., Carrie, L., Rezanoff, S. N., Palepu, A, et al. (2017). A randomized trial examining housing first in congregate and scattered site formats. PLOS ONE, 12(1), eO168745. Tsemberis, S., Kent, D., Respress, C. (2012). Housing stability and recovery among chronically homeless persons with co-occurring disorders in Washington, DC. American Journal of Public Health, 102(1), 13-16. United States Interagency Council on Homelessness. (2016, September 28). Housing First checklist: Assessing projects and systems for a Housing First orientation. Retrieved from https://www.usich.gov/tools-for-action/housing-first-checklist.